We all do our best to stay on top of the cleanliness of our home. However, there are always things we forget about. Here are the top 10 most forgotten things to clean in the home. How many are you guilty of? Be sure to get right on that! And we don’t mean taking out the trash, we mean cleaning the actual can itself. Trash bags get holes, which allows gross trash juice to drip down into the can and smell. Take your can outside and spray it out with a hose, allowing it to dry before you bring it back inside. You touch your phone all day, every day, no matter where you may be. You put it up to your face. You use it while your eating. And yet you never sanitize it. Germs build up on cell phones, in fact, they are one of the germiest things out there. Take a minute and wipe down your phone, front and back, with a sanitizing wipe to kill any germs or bacteria. We don’t mean just vacuuming, although that should be done more often in most homes too. Vacuums don’t pick up all of the dirt, germs, allergens, and bacteria that accumulate in carpets over time. You need to get your carpets deep cleaned every so often to keep them (and your home) healthy! That pink or orange build up at the bottom of your shower curtain? That’s mold, and it needs to go. Most shower curtains and simply be tossed int eh washer and then hung back up to dry, making it an easy chore. There’s no excuse for a dirty shower curtain. Afterall, that’s where you get clean! Air vents circulate air throughout your home. If they are dirty, they also circulate dust and dirt. We know that they’re tucked away so you don’t think about them often, but get your air ducts cleaned so you aren’t breathing in crap all day. What do you touch the most in your home? Probably the door knobs and light switches. That’s a lot of opportunities for germs and bacteria to build up on them. Use a sanitizing wipe to clean them easily. You probably just refill you ice tray when it’s empty and move on. It’s just water, right? Well, except for everything that you ice tray comes into contact with, from your hands to everything in your fridge. Throw your ice cube trays in the dishwasher regularly to keep them clean and healthy. You empty your vacuum, but how often do you clean the filter? This is where small particles you have vacuumed end up, and if you go too long without cleaning, your vacuum will become much less effective. Check your vacuum’s instructions to learn how to access the filter to clean or replace it. Your microwave touchpad gets touched with greasy hands, and yet it never gets cleaned. Change that. Wiping it down with a sanitizer will do the trick. I know that you sweep and mop. However, over time the protective barrier on tile breaks down, causing it to be the perfect breeding ground for mold and bacteria. You need to get your deep cleaned and resealed in order to keep it truly clean. 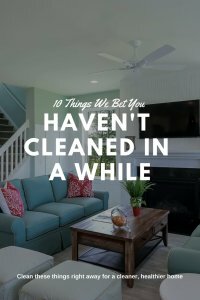 If you make sure that you clean these 10 places, you’ll have a much cleaner and healthier home for you and your family to enjoy.